I pride myself on keeping this blog humorous yet informative. When I started this online venture, I vowed to not create another blog on education centered around one main person espousing their “expertise.” I also vowed to never be the guy who wrote weekly love letters on education that were so saccharine you could rub a plain bagel on them and it would immediately turn into a glazed donut. Having said all that, as we lead up to the National “March For Our Lives” event, I wanted to use this week to earnestly (mostly) discuss what each of us can do to make a positive daily difference on a very local level—because while marching and protesting are crucial components of fighting the disease of gun fetishism in our country, neither are enough. Short of flying out to one of the cities holding the marches, many teachers are left feeling helpless in the movement to make our schools safer. We fear that this will become yet another issue in education where Washington bureaucrats will take over and tell us how to do a job they know very little about (there’s an old comedian’s response to a heckler that applies here…something along the lines of, “Hey, I don’t come to your job and slap the [something] out of your mouth, do I?” In the interest of avoiding any workplace (or district) filters, I think I’ll just leave it to you to fill in the blank). So how can we all make a daily difference? Well, as I mentioned, it starts at the local level. For me, I determined that I needed to find a way to improve my own teaching practices and, by proxy, improve the culture of my classroom and possibly my entire school site. Creating such seismic change is, admittedly, a big task. But when you think about it, Angelina Jolie went from being the crazy girl who made out with her brother at the Academy Awards, to becoming the sexiest woman alive, to America’s most hated home wrecker, then becoming America’s most beloved octo-mom philanthropist, until she finally settled on being a skeleton with makeup that we are all completely ambivalent about. So yeah, changing the culture of my school site was a big task, to be sure...but with guidance and direction (and maybe a little help from tabloid magazines), anything was possible. The problem was I had no direction. I read a lot of articles about classroom culture in the days following the Parkland shooting and I didn’t find any new strategies that I could connect with, nor did I find anything that was scalable (meaning, that others could simply do the exact same thing and have an equal and almost immediate impact on their classes and/or schools). Then I read a Facebook post by an educator named Marcey Raymond Kusper and everything changed for me. In her post, Kusper mentioned that her students were divided over whether or not a school walkout was meaningful, or if it would send a strong enough national message to have any lasting impact. “I think it’s stupid,” one of Kusper’s students said, according to her post. Now, you might be sarcastically thinking, “Wow, a cynical, counterculture teen who perpetually scoffs at any efforts by adults to make their lives better? How extraordinarily nouveau! What’s next? A nine year-old who begs for a dog, then whines about walking it every morning?” But you’d actually be surprised by how this story turns out. See, Kusper’s students didn’t just complain, they devised solutions, too. According to Kusper, her students asked, “How about you make friends with 17 kids you normally wouldn’t...?” Kusper then went on in her post to list other ways her students felt they could help others at their school involving the number 17 (honoring the number of victims killed in the shooting): Smile at 17 people you normally wouldn’t smile at, say a kind word to 17 people who might not have someone to speak to, etc. And while these types of interactions between students can come across as disingenuous and result in highly problematic social Darwinism, I believed these students were genuine in their desire to make a difference at their own school. 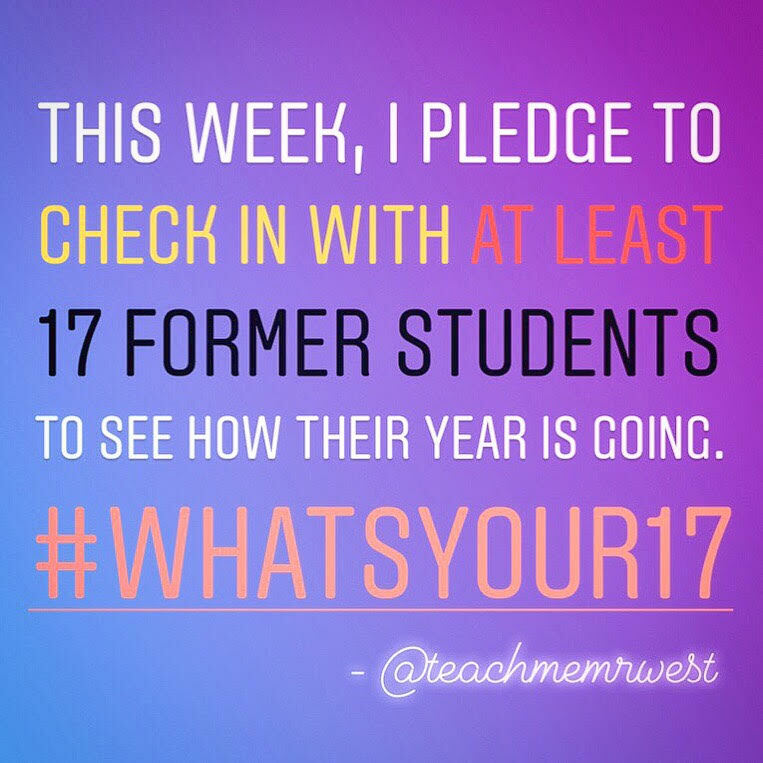 Thus, the hashtag #WhatsYour17 was born—and through it, I had found my direction. 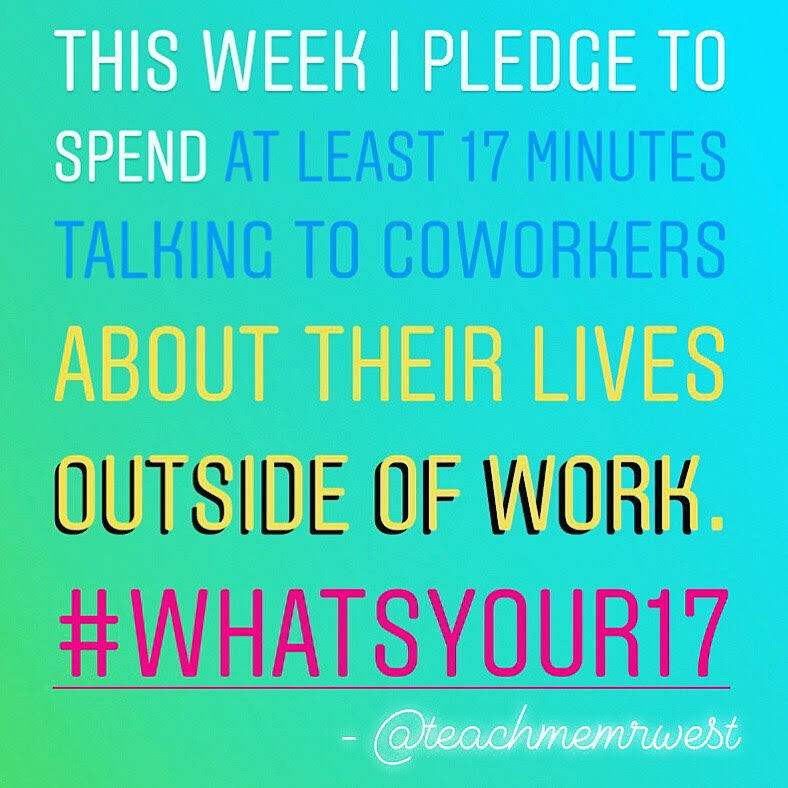 I would create a 17-day challenge for all people (not just educators), and for all students (not just the ones who appeared to be/feel left out). The difficult aspect of this challenge wouldn’t be in its duration; rather it would be in the reflective nature of acknowledging just how many ways we fail (despite our best efforts) to make a daily difference—and a few simple ways we can rectify this. But this challenge turned out to be so much more than I bargained for. It didn’t just challenge other educators to follow my lead with acts of kindness and humility, but it challenged me as an educator and as a person (seriously, this isn’t a bagel-into-a-donut situation…try to come up with 17 realistic, meaningful, emotionally sensitive ways to truly improve the culture in your classroom and at your school site and tell me how easy you found the task). The result of this 17-day challenge is that I grew in more ways than I can fully explain in a post that I promised wouldn’t take longer than your 6.2 minutes of bathroom time to read. The other day I finished the 17-day challenge and many of my fellow educators requested that I write a blog post explaining where this whole idea came from and listing each of the challenges in a single location. So here they are, in both picture and list form. Feel free to share this blog post or to share the images on your own social media accounts. As I’ve mentioned before, if you tag me (@teachmemrwest on Facebook, Twitter, and Instagram), I will repost your work and give you a public shout-out for your efforts to improve your teaching, your classroom culture, and your school site on a very local level. DAY 1 – Tell your students how much you appreciate having them in your class. 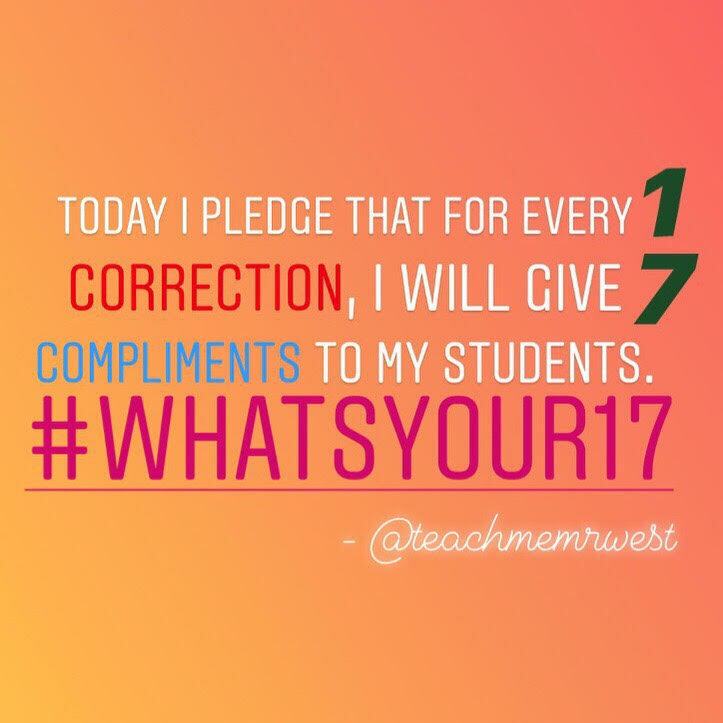 DAY 2 – For every 1 correction, give 7 compliments to your students. 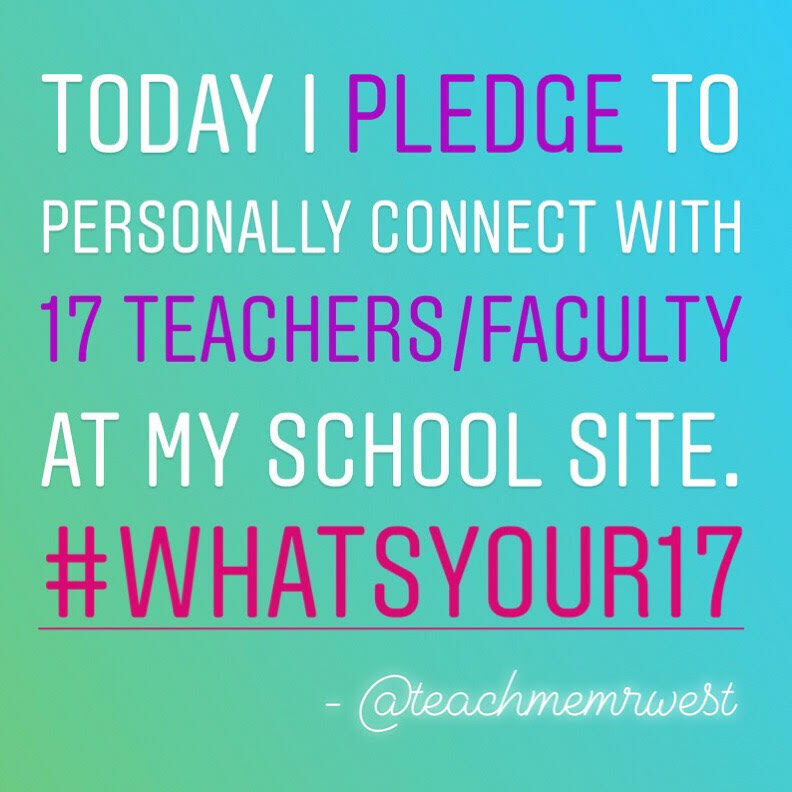 DAY 3 – Personally connect with 17 teachers/faculty at your school site. DAY 4 – High-five 17 kids on campus who aren’t your students. DAY 5 – Email/Call 17 parents to share one positive thing you’ve seen from their child this week. DAY 6 – This week, check in with at least 17 former students to see how their year is going. 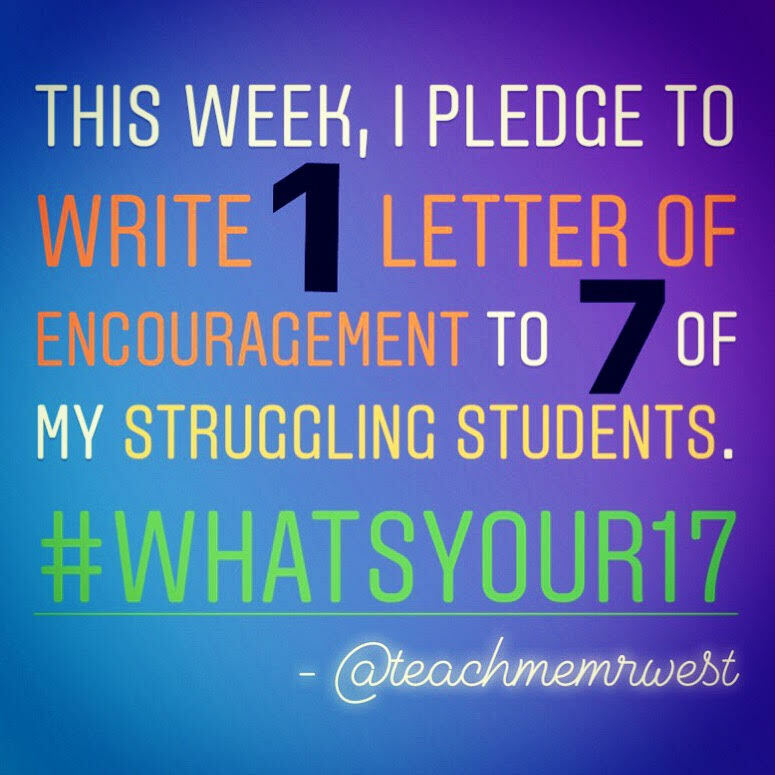 DAY 7 – This week, write 1 letter of encouragement to 7 of your struggling students. 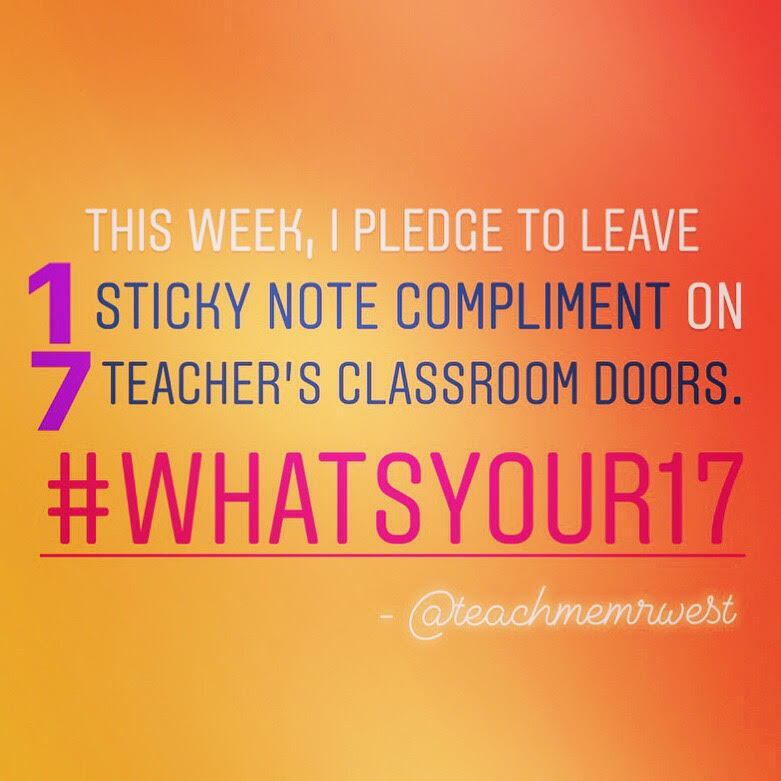 DAY 8 – This week, leave 1 sticky note compliment on 7 teacher’s classroom doors. DAY 9 – This week, spend 1 lunchtime with at least 7 students. DAY 10 – This week, spend 17 minutes talking to coworkers about their lives outside of work. DAY 11 – This month, find and read 17 articles on how to effectively use restorative justice practices in your class. DAY 16 – This school year, help create and foster at least 17 relationships between older students and younger students at your school site. 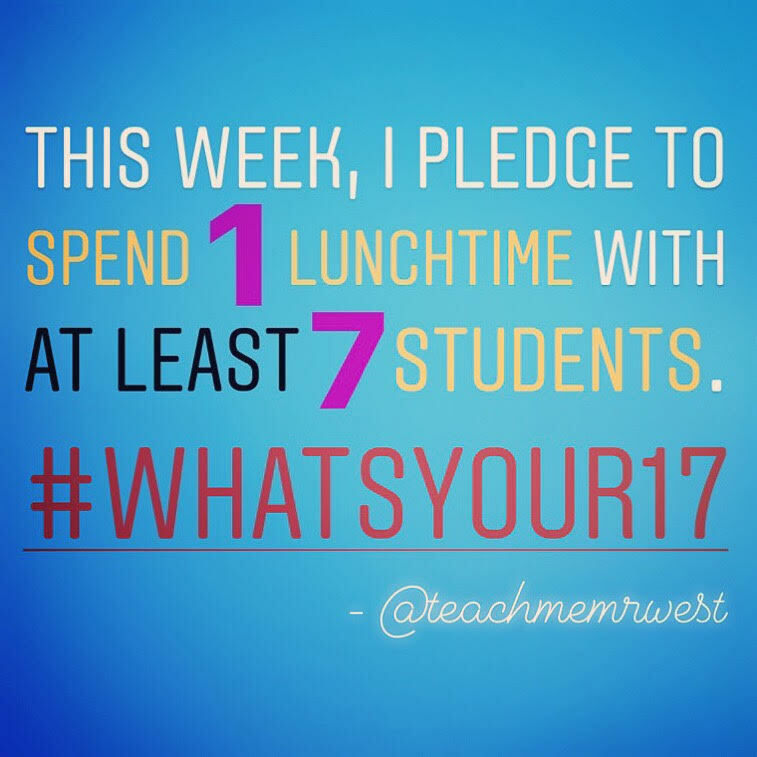 DAY 17 – Next school year, take this 17-day pledge again and make it a regular part of your teaching practices. Like this blog? Why not share it with a few people? REALLY like this blog? Why not submit a question for the next "Teacher's Bag" (fka: Mailbag) post to teachmemrwest@gmail.com? LOVE this blog? Why not write a guest blog post! Email all inquiries to teachmemrwest@gmail.com! It's that simple!